The IT meltdown that grounded thousands of British Airways passengers will cost the airline at least £80m, it has emerged. Willie Walsh, chief executive of BA owner International Airlines Group, told investors its initial assessment of the gross cost "is in the order of £80m". He promised to provide an update with more details when appropriate. The chaos was triggered by an engineer who disconnected a power supply. The major damage was caused by a surge when it was reconnected. Speaking at IAG's annual meeting in Madridon Thursday, Mr Walsh apologised again for last month's chaos, describing it as a "dreadful experience". About 75,000 passengers faced severe disruption when BA's system failed over the Bank Holiday weekend. Mr Walsh said BA was "working hard to ensure that affected passengers are compensated as soon as possible". He had previously announced an independent investigation "to learn from the experience". During the outage, the GMB, a union which represents aviation workers, claimed the problems had been caused by BA making IT staff redundant and outsourcing the department last year. Mr Walsh said on Thursday: "What we do know at this stage, however, is that this failure had absolutely nothing to do with changes to the way we resource our IT systems and services." IAG chairman Antonio Vazquez said: "You can be reassured that we will do everything in our powers to avoid similar problems in the future and restore our customers' faith in British Airways." BA was one of several airlines affected by a baggage system problem at Heathrow on Thursday morning. Hundreds of passengers on flights operated by IAG-owned Iberia, as well as BA and American Airlines at terminals 3 and 5 had to fly out without their luggage. 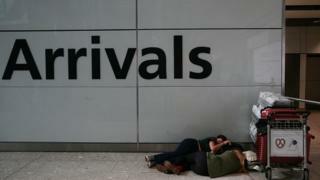 Heathrow said the problem has now been fixed and apologised.